I was relatively surprised when I went to check out the newly redesigned League of Legends website and saw that a new champion had been announced. Considering how long the developer typically takes to reveal a new champion after teasing them, this has been a pretty short time coming with the teaser releasing only yesterday. The teasers featured Explorer Ezreal noting a mysterious dark figure in ancient text and tomes. 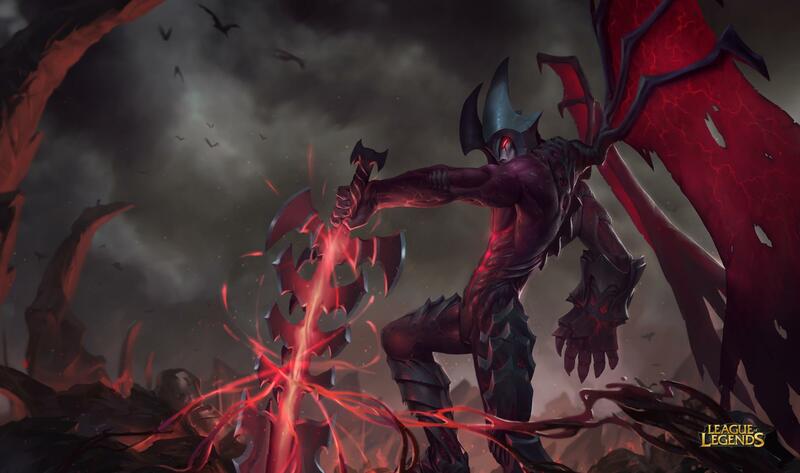 That dark figure has turned out to be Aatrox, the Darkin Blade. A health based champion, Aatrox is described as basic attack dependent melee champion that does well as a duelist and a team fighter. Aatrox stores a portion of his abilities’ health cost in the Blood Well, which slowly drains to a base amount while he is out of combat. When Aatrox loses all of his health, he draws on the Blood Well and recovers the amount of health stored. Aatrox rises into the air and slams into a target location. Enemies within the impact zone are knocked up and take damage, while nearby enemies take damage. Aatrox heals himself on every third attack. Activating Blood Thirst toggles Blood Price. Blood Price: Every third attack now deals bonus damage instead of healing Aatrox. Aatrox loses health based on the bonus damage dealt. Aatrox fires a line attack that damages and slows enemies caught in its path. Aatrox is refunded a part of the health cost if Blades of Torment strikes an enemy champion. Upon activation, Aatrox instantly damages enemies in an area around him. For the duration of Massacre, Aatrox gains bonus attack speed and range. Massacre has no health cost. Riot currently has Aatrox pegged as a top-laner but it should be interesting to see where he ends up spending the majority of his time. For more on the new League of Legends champion, check out the official reveal. Oh, and for all of you Ahri fans, your champion is no longer the first in champion select. I know it hurts. What do you think of the new champion? Let us know in the comments!